The human presence that animates the personal essay is surely one of the most beguiling of literary phenomena, for it comes across in so familiar a voice that it’s easy to believe we are listening to the author rather than a textual stand-in. But the “person” in a personal essay is always a written construct, a fabricated character, its confessions and reminiscences as rehearsed as those of any novelist. In this first book-length study of the personal essay, Carl Klaus unpacks this made-up self and the manifold ways in which a wide range of essayists and essays have brought it to life. By reconceiving the most fundamental aspect of the personal essay—the I of the essayist—Klaus demonstrates that this seemingly uncontrived form of writing is inherently problematic, not willfully devious but bordering upon the world of fiction. He develops this key idea by explaining how structure, style, and voice determine the nature of a persona and our perception of it in the works of such essayists as Michel de Montaigne, Charles Lamb, E. B. White, and Virginia Woolf. Realizing that this persona is shaped by the force of culture and the impress of personal experience, he explores the effects of both upon the point of view, content, and voice of such essayists as George Orwell, Nancy Mairs, Richard Rodriguez, and Alice Walker. 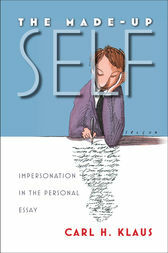 Throughout, in full command of the history of the essay, he calls up numerous passages in which essayists themselves acknowledge the element of impersonation in their work, drawing upon the perspectives of Joan Didion, Edward Hoagland, Joyce Carol Oates, Leslie Marmon Silko, Scott Russell Sanders, Annie Dillard, Vivian Gornick, Loren Eiseley, James Baldwin, and a host of other literary guides. Finally, adding yet another layer to the made-up self, Klaus succumbs to his addiction to the personal essay by placing some of the different selves that various essayists have called forth in him within the essays that he has crafted so carefully for this book. Making his way from one essay to the next with a persona variously learned, whimsical, and poignant, he enacts the palimpsest of ways in which the made-up self comes to life in the work of a single essayist. Thus over the course of this highly original, beautifully structured study, the personal essay is revealed to be more complex than many readers have supposed. With its lively analyses and illuminating examples, The Made-Up Self will speak to anyone who wishes to understand—or to write—personal essays. Carl H. Klaus, founding director of the University of Iowa’s Nonfiction Writing Program, professor emeritus at the University of Iowa, and co-editor of Sightline Books: The Iowa Series in Literary Nonfiction, is a diarist, essayist, and author or co-author of several textbooks on writing. His nonfiction includes My Vegetable Love (Iowa paperback, 2000) and its companion Weathering Winter (Iowa, 1997) as well as Taking Retirement: A Beginner’s Diary and Letters to Kate: Life after Life (Iowa, 2006).